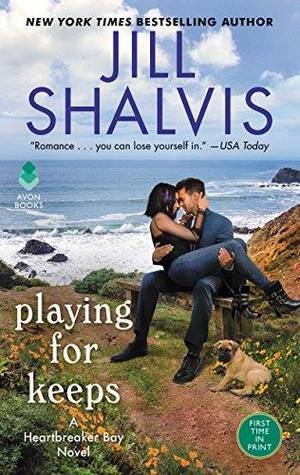 Playing for Keeps by Jill Shalvis– When it comes to the confident, charismatic Caleb Parker, Sadie Lane feels the spark—the kind that comes from rubbing each other the wrong way. She’s a tattoo artist, he’s a straight-laced mogul. But after they accidentally co-rescue an abandoned dog from a storm, Sadie sees a vulnerable side to the seemingly invincible hottie. My Thoughts: I will be shocked if this isn’t one of my best books of 2019. I loved everything about it. Sadie was probably one of my favorite female main characters because I saw so much of myself in her. I could relate to her thoughts, her actions, her feelings. At one point I had to put the book down and take a deep breath because it was like reading about myself. I felt her pain, her fears, her insecurities. And it was hard not to superimpose myself into her place within the book. That kind of writing? It’s rare. There was so much pain in Sadie’s past and she was so guarded and careful with her feelings to the point of being standoffish and cold. It took rescuing an abandoned dog, who she named Lollipop, to really start to thaw her heart. And she fought that thawing all the way, kicking and screaming. What began as a shared custody situation with a dog turned into an epic love story. Caleb was the perfect match for her. He pushed but not hard enough to scare her away, he accepted her dark and painful places, and he never gave up on her. He’s a book boyfriend hero, for sure! There were other characters in the book that I had some not so warm and fuzzy feelings about at different points. I thought Sadie’s family was a bunch of a-holes who didn’t deserve her. And Caleb’s sisters were the nosiest bunch of busy-bodies but at least they meant well. All in all, this is a book that I borrowed from the library e-book selection and loved it so much that I bought it!